Total solar eclipse over Wyoming. Wyoming eclipse. Great American Eclipse. 2017 solar eclipse. Solar eclipse 2017. 2017 eclipse. 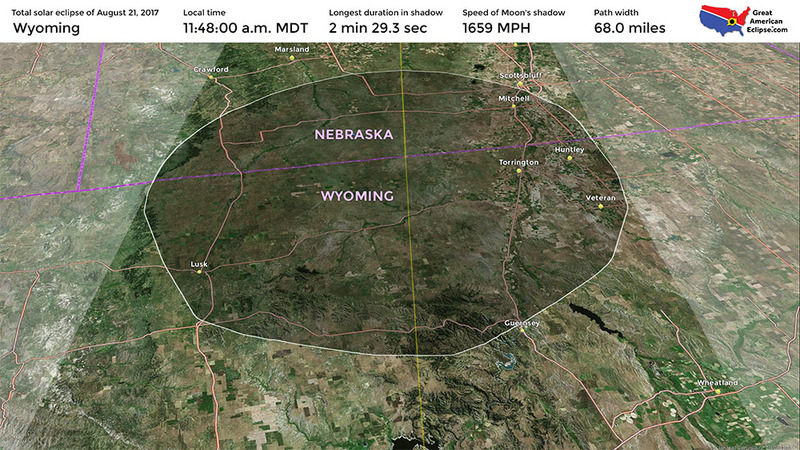 Wyoming will be a popular choice for eclipse chasers because of the good weather prospects, Uncrowded highways (outside the Jackson Hole area), and good duration of totality. The most dramatic scenery for this 2017 eclipse can be found in Wyoming. 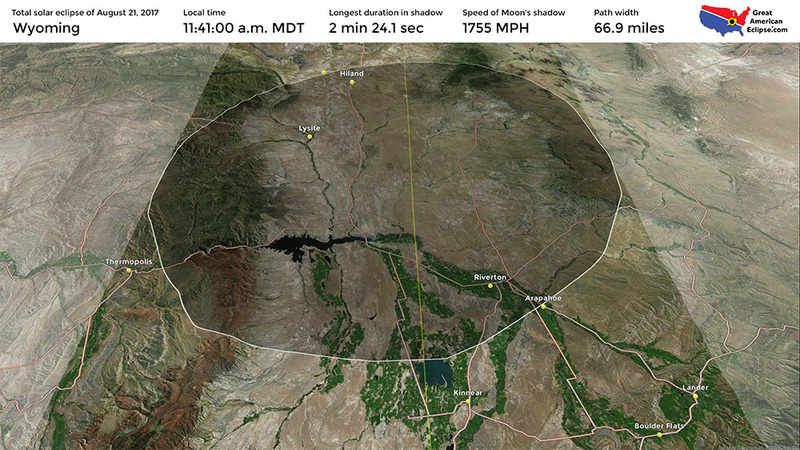 While Yellowstone National Park is just north of totality, Grand Teton National Park is squarely centered in the eclipse path and will surely be a magnet for eclipse observers. 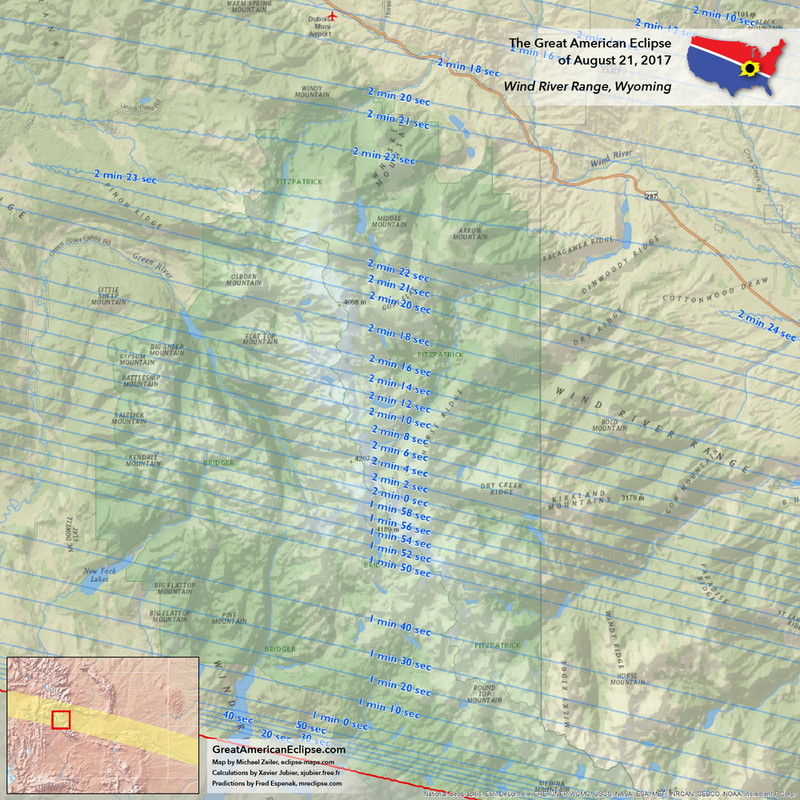 While there are many hotels and campgrounds in this area, they will undoubtedly be inadequate for the onslaught of eclipse tourists drawn to the most majestic mountains in the contiguous 48 United States. And it will indeed be a spectacle! As emphasized on several pages of this website, either a view from a mountain top or a valley view with surrounding mountains will offer another dimension to your eclipse experience, the chance to see the Moon's shadow rushing along the landscape. 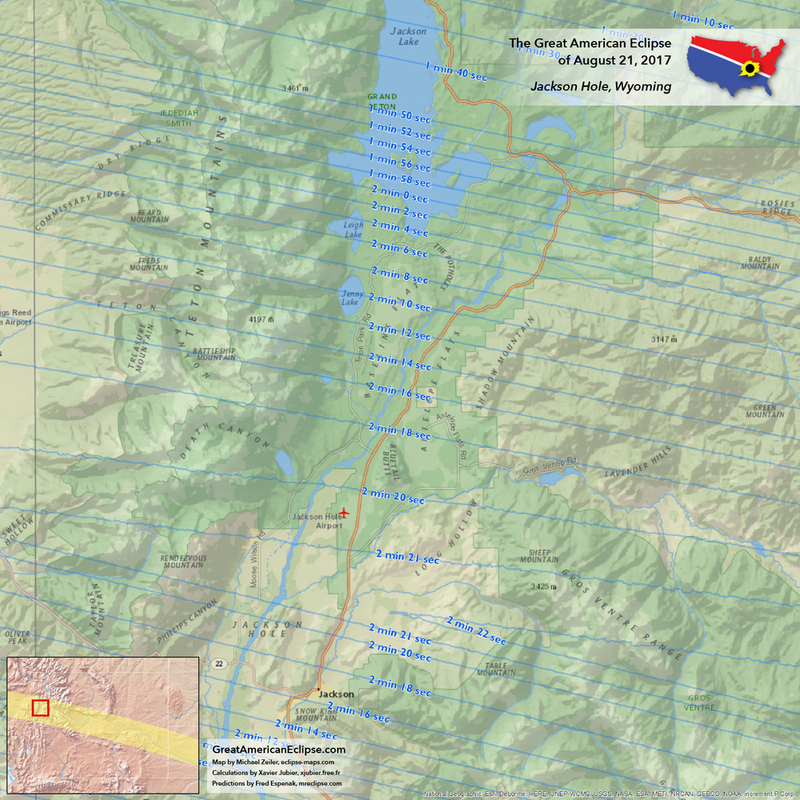 An easy way to get to a mountain top for this spectacle will be to ride the Jackson Hole Tram which has a broad ridge on top which can accommodate many eclipse observers. 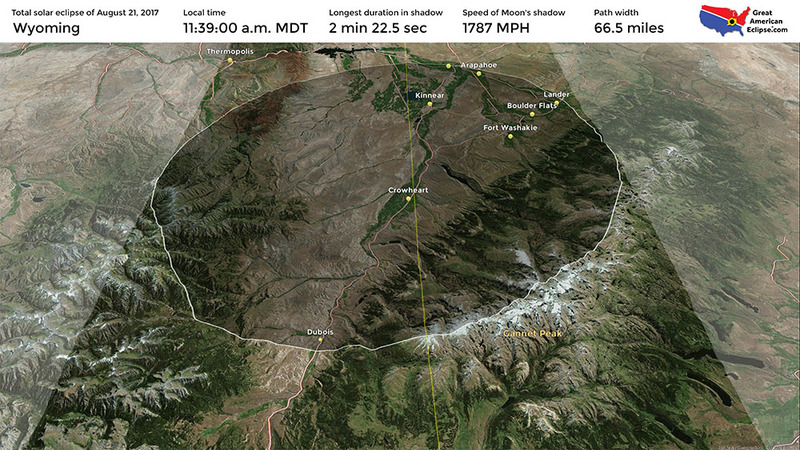 This rarefied location enjoys 2 minutes and 19 seconds of totality. The limiting factor will be the carrying capacity of the tram between its opening and eclipse time. 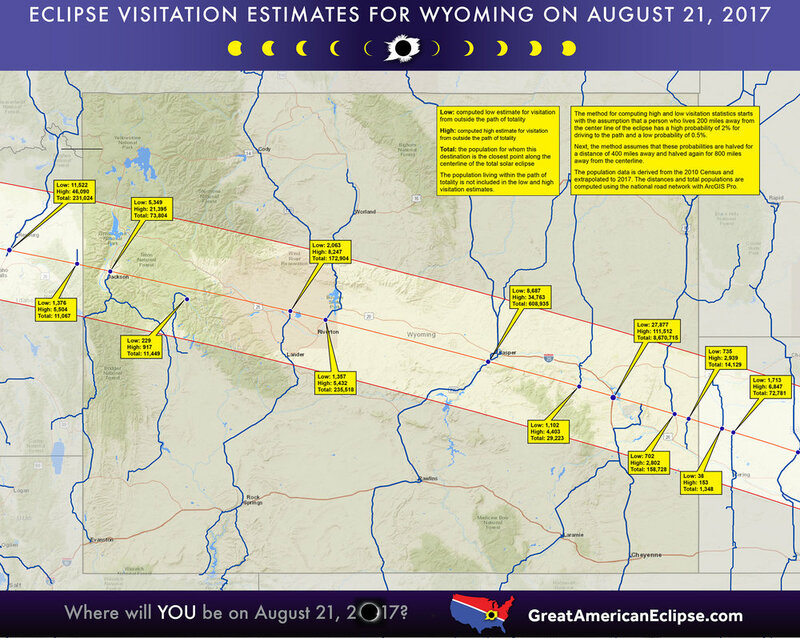 CLICK FOR THE Wyoming STATE PAGE ON ECLIPSEWISE.COM. 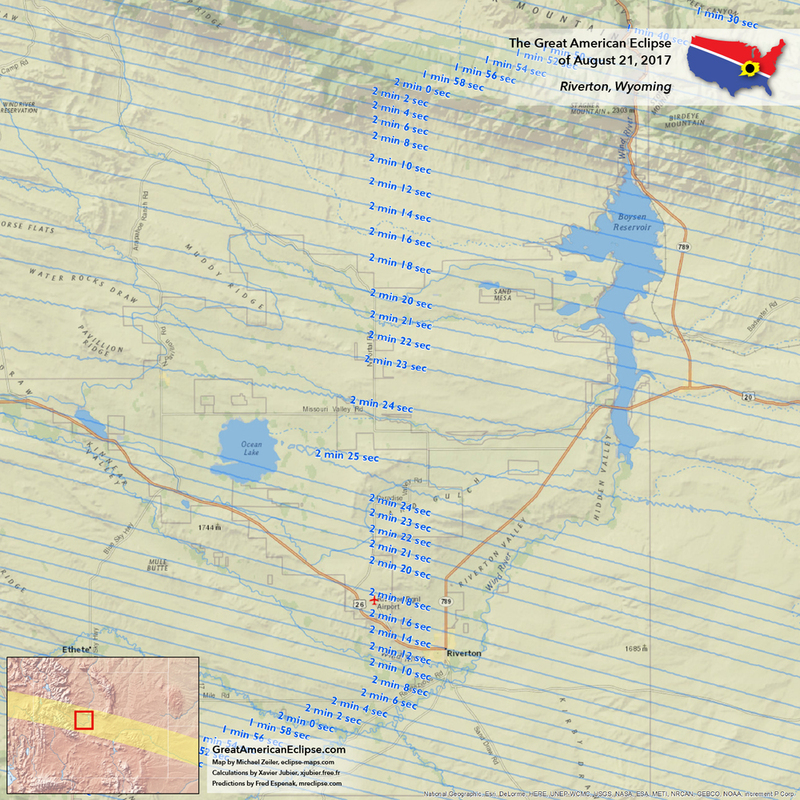 THE SITE PROVIDES THE MOST COMPREHENSIVE AND AUTHORITATIVE STATE PAGES FOR THE 2017 ECLIPSE. ECLIPSEWISE.COM IS BUILT BY FRED ESPENAK, RETIRED NASA ASTROPHYSICIST AND THE LEADING EXPERT ON ECLIPSE PREDICTIONS. Fortunately, there are other scenic but lesser visited locations just to the east of Jackson Hole. The Gros Ventre Wilderness and the Wind River Range offer some of the best hiking and backpacking in the United States. An appealing location is the Green River Lakes campground with a view of the eclipsed Sun above a lake and scenic Squaretop Mountain. The central part and eastern part of the state is sparsely populated with good odds for clear skies. 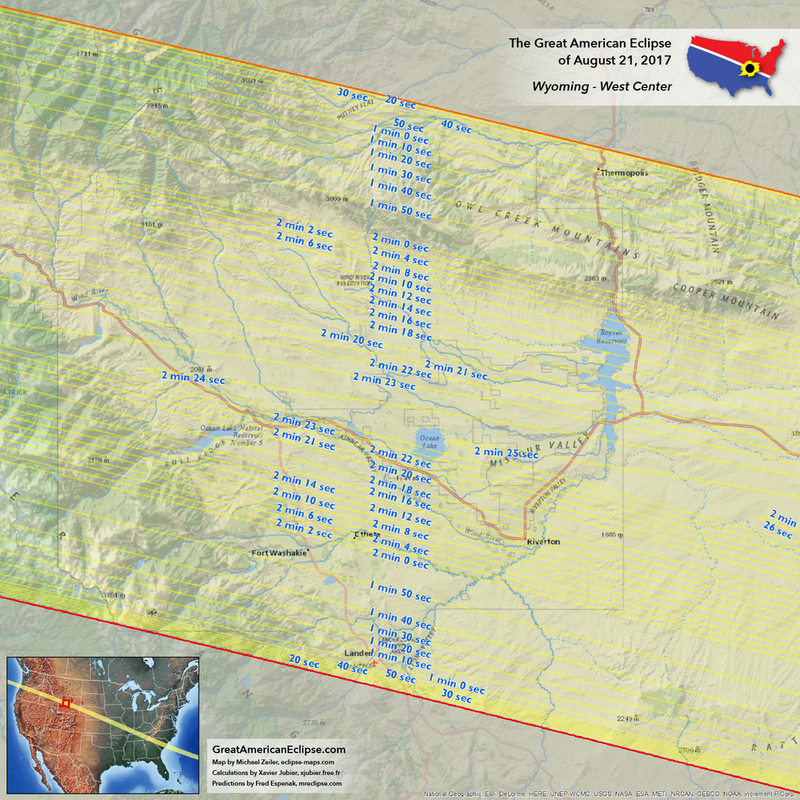 Many amateur astronomers will converge on Casper, Wyoming for the concurrent convention of the Astronomical League and keynote address by eclipse expert Fred Espenak. The uncrowded roads should offer quick mobility in case clouds threaten. 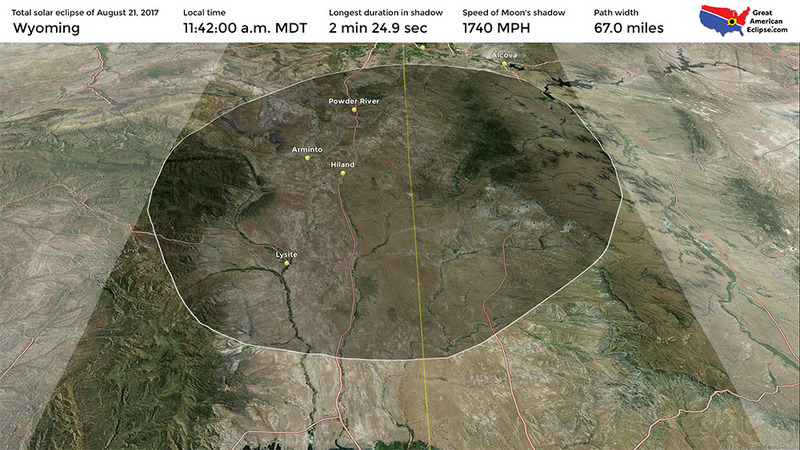 While the odds of clear skies are not quite as good as Oregon and Idaho, by closely inspecting the weather forecast in the days before the eclipse and retaining the flexibility to quickly relocate, you should almost certainly see the eclipse with success in Wyoming. 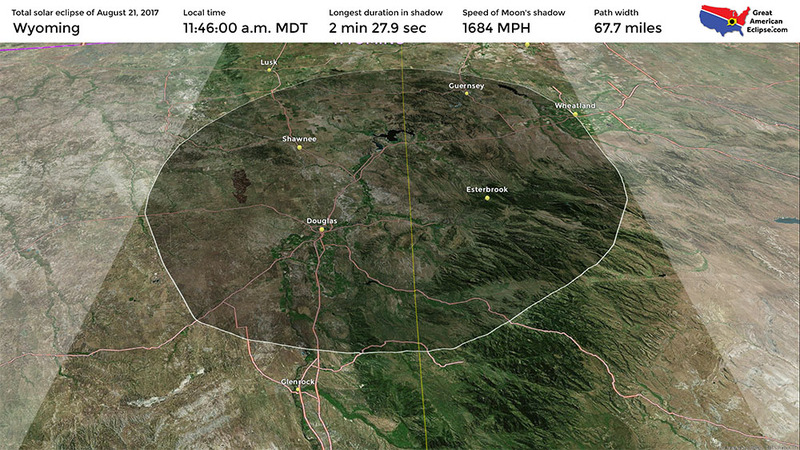 Consult eclipser.ca for Wyoming weather prognostications for August. 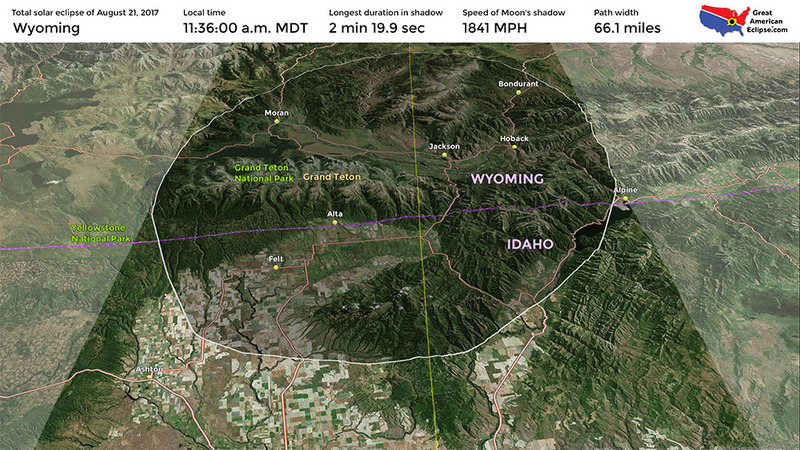 Another valuable resource for local Wyoming weather is www.mountainweather.com which will provide timely data about micro-climates in this area before eclipse day. 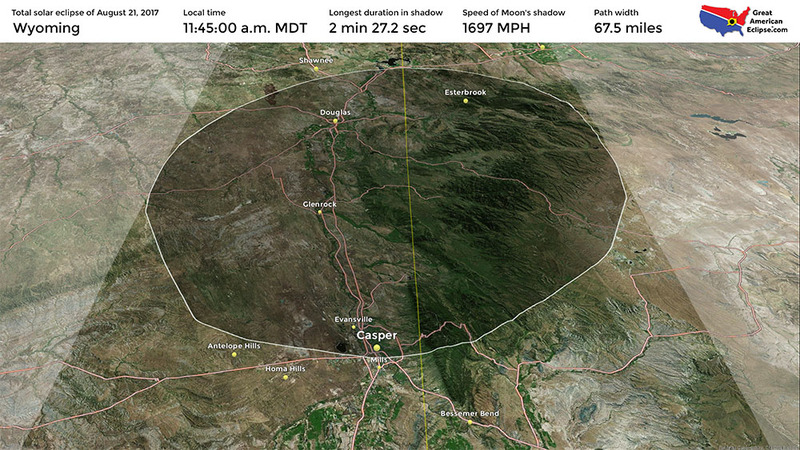 Also consult the Jackson Hole Astronomy Club at www.jacksonholeastronomyclub.com for local viewing advice and options. This report is from a ridge line south of Loveland Pass, Colorado. The reference to Vulcan at the end reflects the search in this era for a hypothesized planet inside Mercury's orbit posited to be visible only during totality. Vulcan was never found after several decades of search. This article from 1878 tells why viewing an eclipse from mountain or ridge top will be a memorable experience. By selecting this type of location, you will surrender mobility in case thunderclouds build, but if the short term weather forecast is good you could play the odds and see what these lucky observers of the 19th century witnessed.